It was the ultimate touchdown. After a fabulous flight in a seaplane, over hundreds of little islands, emerald and platinum jewels set in a sea of turquoise, we came down with a whirr and a splash into the middle of a tropical ocean. Kunfunadhoo Island, our destination and home to Soneva Fushi Resort, is one of the biggest islands in the Maldives, but still too small for a landing strip. But this was a much more glamorous way to arrive, and much more suited to the romance of the setting. Soneva Fushi is ridiculously romantic, it has to be said – the stuff of every clichéd island fantasy. There are pristine white beaches, balmy blue waters, and a lush interior full of dappled shade and leaves whispering in the breeze. This is one of those rare places that manage to pull off the feat of being luxurious and unpretentious at the same time. You sit down for a five-course dinner served with fine wine, at a table glowing with candles and crystal, but under the table your bare feet sink into still-warm sand. This no-shoes attitude plays a big part in making Soneva Fushi feel so relaxed – it’s hard to be stressed when there’s sand between your toes at all times. In effect, our front garden was a private beach. A mother hen led her chicks across the sandy space between the hedges each morning, clucking protectively. And every evening, a rabbit came out to play, a surreal Watership Down silhouette against the waves. Being there was like sitting in a secret world, with a sandy lawn that led to a sunlit sea, with another secret world to enjoy beneath the waves. For those looking for pampering and diversion, the resort has a spa and a boutique and diving and tennis and windsurfing. But I had all the pampering and diversion I needed, what with hens and rabbits and waves breaking and palm fronds swaying and feeding the birds that came to call. They sang beautifully for their suppers – the crumbs of the feasts enjoyed at the table on my very own patch of beach-garden. Champagne breakfasts at first light and seafood lunches go a long way to keeping a girl happy between books and bobbing about in balmy waters under a tropical sun. In fact, I was totally over-scheduled. So much to do and so little time to do it in – I had to fit in walks around the entire island at dawn and at sunset, as changing light and colour splashed across the water and the sand. And daytime wanders through the shady and enchanted glade that made up the interior. And a most memorable barbeque, on a long and lonely spit of sand a short boat ride away, where cold white wine was drunk as fires were lit and fresh fish grilled as the sun went down, throwing a shimmer over the gentle waves that lapped at this whole world away from the world. Bekim blogs normally at HotelMee.com. 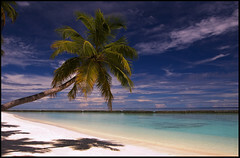 Maldives is a great place for a romantic getaway, secluded and the view is breathtaking!